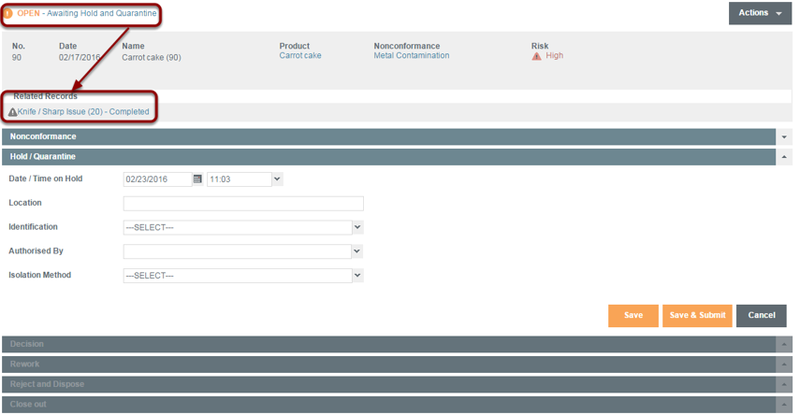 All records in Safefood 360° have a structured work flow to allow the user complete work in a logical and phased manner. Work is completed in manageable chunks and different users can complete different sections of the work flow. Displays the active section of the work flow. This section must be completed before moving on to the next section. Save: Saving saves the workflow stage content but does not close the record off or progress you to the next stage. This is handy when you want to "save a draft" of the record. Save & Submit: This submits the form you are completing which means you will progress either to the next workflow stage or close the record out. Cancel: This will cancel your current activity and return you either back to the module or return you back to viewing a completed workflow stage. 3. 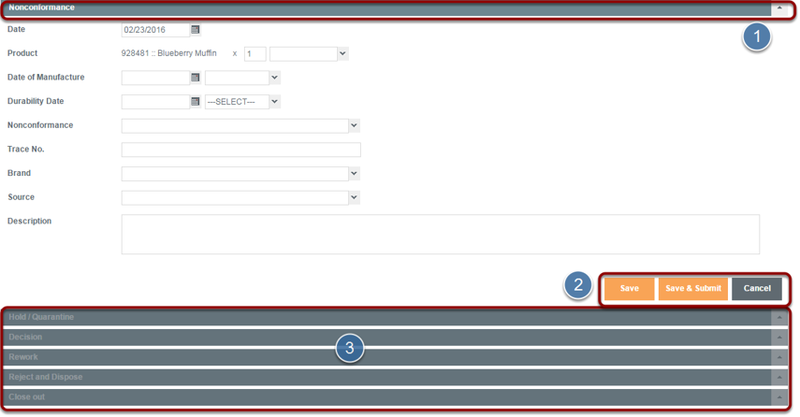 The inactive sections in each work flow are displayed so that you know what to expect next. This helps to provide and maintain structure, and to ensure that each section of the workflow is completed as intended so that later checks are clearly understood. As each section is completed the preceding section remains in an active but saved state. This can be modified through re-selecting the stage and selecting 'edit'. Once all work flow sections are complete all sections will remain active and saved. A workflow stage may by grayed out. In this case it means the completion of that stage has not been necessary for that particular record. When all sections pertinent to the record have been completed the workflow stages should 'closed out'. Where records are not 'closed out' and remain incomplete the Actions tab will show the specific section which is awaiting input. By clicking on the action required you will be taken straight to that work flow section, where you can view, amend, or close out that section. Every record will display its status at the top of the record which will always correspond to the active section awaiting input.